Tomorrow my work is taking me to the USA for 9 days, so I decided to sow my Lophophora seed a bit earlier than planned. 30 seeds of each of the species mentioned below were sowed. I recently lost all of last years Lophophora fricii seedlings (and a lot of the L. diffusa and L. williamsii seedlings as well) because of too prudent a watering scheme – or so I presumed. To my dismay the withering of the surviving seedlings continued, even after generous waterings. After a closer inspection of the seedlings, using a x10 magnifying lens, the reason became clear: a bunch of red spider mites were feasting on the plants. The plants were promptly sprayed with insect soap and the treatment will be repeated in a week. It probably won’t kill off all of the spider mites, so the battle is now on. Last year I fought the spider mites using soap, predator mites, cinnamon and garlic brews, and by raising the humidity levels and increasing the air circulation – apparently some survived. I wonder if I would have been able to save my L. fricii plants if the mites had been discovered sooner. Two days ago, at the beginning of the weekend, there were not many signs that the Obregonia or Ariocarpus seed would germinate. Tonight more than half of the Obregonia and a few of the Ariocarpus seed had germinated. The seedlings still have a pale, yellowish hue - hopefully they will take on a healthier chlorophyll-green in a couple of days. A week after sowing the seed the first couple of seedlings have appeared. Small green “blobs” the size of (extremely small) pinheads. I expected the seedlings to be very small, but these seem infinitely fragile. Hopefully they will survive the first critical period. The seed (30something of each species) were handled as described in “Growing cacti from seed”. 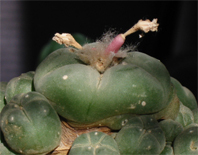 I’m holding my Lophophora seed back – I’m planning on sowing an indoor batch in early spring and a cold house batch in late spring.